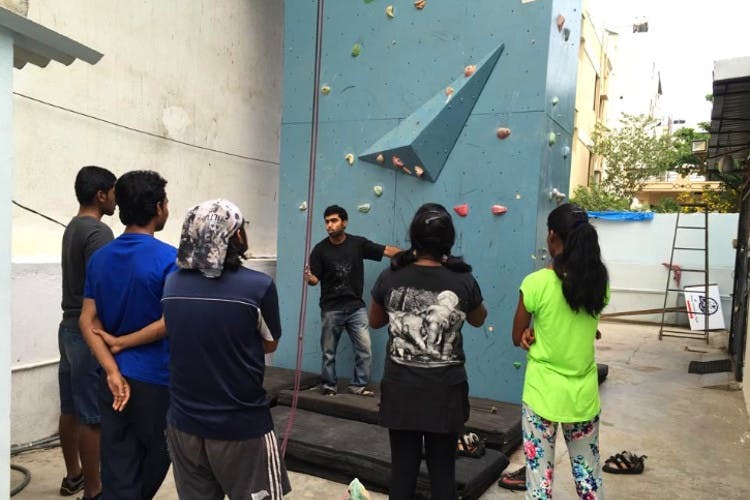 Adventure seekers, have you been to Crag Rock Climbing studio in Gachibowli yet? If you haven’t, you totally should for an action-packed yet safe activity you can enjoy with friends or by yourself too. Move over go-karting and laser tag, it’s rock climbing that’s become the most challenging and exciting sport for city folks. At Crag Studio, you can physically and mentally engage yourself in this sport and have fun while you do it. Apparently the largest indoor rock climbing wall in Hyderabad, this place offers multiple climbing routes that keep changing continually based on your level of expertise. Be it for a rookie or an expert, you will find thrilling challenges here. Of course, it takes a while to master the art of rock climbing, so you can avail monthly membership too where in you can spend multiple hours throughout the month mastering the sport with the help of an instructor. But, you can also pick a route based on your preferences and skills, and experience safe climbs. Anyone over the age of six is allowed to participate in this activity, and that includes your grandma too, if she’s fit enough. They accommodate groups of 15-20 people at once, so you can go here with your office pals, or a daredevil squad. Experience Bouldering with problem-solving, which basically involves boulders marked with problems on coloured stickers and solving them as you climb as well as the Lead And Top wall which is 25-feet high and 20-feet wide where you can climb six different routes. You can either lead or get a fixed rope for your work out. They also have gym equipment like free weights, finger boards, and bars for warm ups and strength training. You also get yoga mats here so you can exercise. The price for one hour of rock climbing session is INR 450 per person, whereas it is INR 2,500 (adults) and INR 2,000 (kids) per month. They have quarterly (INR 6,000) and yearly (INR 18,000) membership too if you really want to practice more and excel at the sport. People often pick this place to celebrate birthdays, so carry the cake, invite your friends and rock on.